You are here: Home / Post-Workout / Too Fit Rally Natural Post-Workout Review – Rally for More Results! Too Fit Rally Natural Post-Workout Review – Rally for More Results! Here we go again: another post-workout supplement company claiming its product is the best. Yawn. There’s something about Too Fit Rally Natural Post-Workout which piques our interest, folks (aside from the catchy name). Another interesting review is in the offing. 2:1 carb-to-protein ratio. Thirty grams of cyclic dextrin and 15 grams of PeptoPro protein. Great ingredient combo. One of the best we’ve seen to date. Clean ingredients. No dirty ingredients, fillers, and proprietary blends. Other Ingredients: Stevia (leaf) Extract, Natural Flavor. Directions: Rally is a post-workout and/or intra-workout recovery formula. As a dietary supplement, take 2 scoops with 16-24 oz. of water immediately after training. May begin consuming during a workout and finish it after the workout. DO NOT exceed 4 scoops per day. So, what’s your nominee for the catchiest post-workout supplement name? Some of you believe it’s MyProtein Hurricane XS, an excellent product from the United Kingdom. Or it could be Myogenix AfterShock, a post-workout with many extra health benefits. For our part, the front-runner is Too Fit Rally Natural Post-Workout. Try a comprehensive post-workout supplement such as Too Fit Rally Natural Post-Workout after a grueling gym session. Just when do you associate “rally” with a post-workout supplement? The only instance we can think of is a product helping you rally to get big results. Yeah, we like the sound of that. Too Fit U.S.A., the manufacturer, dubs the supplement simply known as “Rally” “a complete recovery formula that targets all aspects of post-workout nutrition,” per its official website. Too Fit Rally Natural Post-Workout’s first goal is to replenish and repair your body with its 2:1 Carbohydrate-to-Protein Blend. This blend is the product’s main foundation, per Too Fit U.S.A’s website. Its first component is 30 grams of carbs per serving derived from highly-branched cyclic dextrin. After a tough workout, your body’s glycogen stores (a form of carbs used as energy stored in your muscles) become depleted. Post-workout carbs such as cyclic dextrin will help replenish them. This form of carbohydrate is six to eight molecules of dextrose fused together. Cyclic dextrin helps support endurance, which helps prepare you for your next workout. It also asses through the digestive system quicker, resulting in fewer side effects. The other half of Too Fit Rally Natural Post-Workout’s 2:1 Carbohydrate-to-Protein Blend is 15 grams of PeptoPro protein per serving. PeptoPro is a unique kind of protein, to say the least. It is water-soluble and lactose-free. Your muscles absorb these peptides in rapid-fire fashion. The good thing about PeptoPro protein is it stays in your system longer for better muscle preservation. Why? It’s a form of casein protein. To top it all of, PeptoPro has a complete amino acid profile your muscles need for protein synthesis. Amazing, to say the least. We’ve never seen a post-workout product which uses PeptoPro as its protein source, until now. Too Fit Rally Natural Post-Workout’s protein component – while not that high at 15 grams per serving – can still help you build and maintain muscle mass. In a study involving 50 German athletes, researchers concluded “co-ingestion of carbohydrates with PeptoPro showed a large additional increase (∼110 percent) in post-exercise insulin response compared to ingestion of carbohydrates alone. The next part is the Electrolyte & Mineral Replenishment Blend which features five grams of CocOrganic organic freeze-dried coconut water per serving. Coconut water has become a popular addition to some post-workout products, and with good reason. It’s rich in potassium, magnesium, phosphorus, and calcium. In terms of post-workout benefits, coconut water helps amp up hydration, improve exercise performance, maintain healthy blood pressure levels, and boost cardiovascular health. What’s not to like, folks? Ditch the commercialized sports drinks. Stick to good ‘ol coconut water after a hard aerobic workout. Good thing it’s in Too Fit Rally Natural Post-Workout. This product’s next feature is its Rebuild & Repair Blend. As the name suggests, this blend helps restore and repair damaged muscle tissue after training. You can find all of the post-workout staple ingredients here. First up is three grams of glutamine – the most abundant amino acid – per serving. Glutamine not only helps preserve muscle mass, it also helps increase human growth hormone (HGH) levels and boost the immune system. When you scour for a good post-workout, make sure it has glutamine, folks . 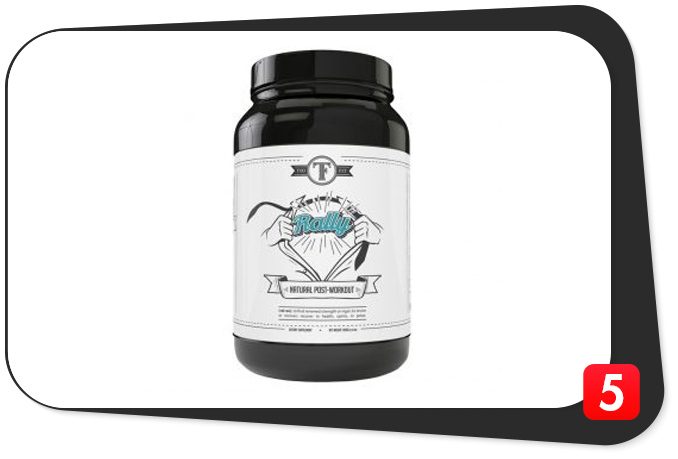 Too Fit Rally Natural Post-Workout also has 2.5 grams of Creapure per serving. Creapure is a German brand of creatine monohydrate which helps you build muscle mass and improve athletic performance. Now, what post-workout supplement wouldn’t have BCAAs? Too Fit Rally Natural Post-Workout does, following a 2:1:1 ratio – 1,000 milligrams of leucine, 500 milligrams of isoleucine, and 500 milligrams of valine, to be precise. A good number of post-workouts have at least three grams of leucine per serving because of its ability to kickstart muscle protein synthesis. Even though, this product has only 1 gram of leucine per serving (to think each serving is comprised of two scoops), the other components – PeptoPro, Creapure, glutamine – should help offset that. Still, we wish the leucine content could have been a tad bit higher – it’s one of the post-workout supplements with the lowest amounts we’ve seen to date. The final ingredient of Too Fit Rally Natural Post-Workout’s Rebuild & Repair Blend is 1.6 grams of beta-alanine per serving. This ingredient helps improve exercise performance. It also helps boost recovery by reducing lactic acid buildup after training. To further boost the manufacturer’s claim Too Fit Rally Natural Post-Workout is “a complete recovery formula,” the product has a potent Antioxidants & Adaptogens Blend. Hey, everything which wards off inflammation is here – tart cherry powder, turmeric, and ginger. Too Fit Rally Natural Pre-Workout also has sumac bran, which is those nasty free radicals’ worst nightmare. Awesome. Finally, this supplement boasts of an Absorption Enhancers Blend composed of a Bioflavonoid Complex and BioPerine, which help boost nutrient absorption. Bravo. Calories, 185: Too Fit Rally Natural Post-Workout has one of the highest calorie amounts for a post-workout supplement, bordering on 200 per serving (two scoops). Not to worry, folks. It’s nowhere near the calorie amount of a mass gainer supplement. Total carbohydrate, 30 g: With Too Fit Rally Natural Post-Workout’s 2:1 carb-to-protein ratio, we expected it to have a high carb content – it has twice the amount of cyclic dextrin as PeptoPro. If you’re carb-conscious, this is not the product for you, unfortunately. Total protein, 15 g: Most post-workout supplements with protein have at least 20 grams per serving. This one has only 15 grams for every two scoops (7.5 grams of protein per scoop). Could have been a bit higher? Definitely. Total fat, 0 g: Too Fit Rally Natural Post-Workout has zero grams of fats. Nada. Try getting fats – the good kind – from your regular meals in the form of avocado, low-sodium nuts, olive oil, coconut oil, salmon, or tuna. Sugars, 3 g: This supplement is low in sugar at just three grams per serving. What could be better than that? Try the stevia content, for one. It’s a low-calorie, plant-based sweetener which helps regulate blood pressure and blood sugar levels. Far too few post-workout supplements include stevia. We’re impressed. Potassium, 140 mg: A mineral which helps improve cardiovascular function and regulate sodium levels in the body. Too Fit Rally Natural Post-Workout’s potassium content is low at just four percent of the daily value. Sodium, 245 mg: This product has 11 percent of the daily value for sodium. It’s bordering on high levels (anything more than 15 percent is considered high). Individuals who are monitoring their sodium intake should ask their doctor for advice first. Sure makes us wish the manufacturer amped up its potassium content to offset the sodium amount. Calcium, four percent DV: Too Fit Rally Natural Post-Workout is not a significant source of calcium at just four percent of the daily value. Get yours from milk instead. Vitamin C, two percent DV: Likewise, this product is not a significant source of Vitamin C (ascorbic acid) at just two percent of the daily value. All we can say is Too Fit Rally Natural Post-Workout does lay claim to being one of the most complete bodybuilding products of its kind on the market. The problem with far too many competitors is they saturate their post-workouts with fancy and useless ingredients. It just wears one out, from a consumer perspective. In contrast, Too Fit Rally Natural Post-Workout cuts right to the chase – most of the ingredients play a vital role in the bigger scheme of things. We love it. We believe the 2:1 carb-to-protein ratio will help you replenish depleted glycogen stores. Yes, you can build muscle as well. We’re just a bit hung up on the 15 grams of PeptoPro per serving. The manufacturer might as well have made it at least 20 grams per serving. It’s a good thing Too Fit Rally Natural Post-Workout other muscle-building ingredients, specifically Creapure (creatine monohydrate), glutamine, and BCAAs. In our opinion, this product sorely lacks leucine, the BCAA which helps kickstart muscle protein synthesis. Other post-workouts have more – a lot more (Jacked Factory POWERBUILD has four grams of leucine per serving). The amounts of glutamine and creatine are just right. When you supplement with creatine, the ideal amount is around five grams daily. Too Fit Rally Natural Post-Workout’s Creapure content is 2.5 grams per serving, which means you can take it twice daily (in reference to the manufacturer’s recommended maximum consumption of four scoops daily). This goes out to individuals who do two-a-days at the gym. We love this product’s Antioxidants & Adaptogens Blend. Like we said, its tart cherry, turmeric, and ginger components help ward off inflammation, a common post-workout issue. Other bonuses include the free-radical-fighting sumac bran content, the nutrient-boosting absorption enhancers (bioflavonoid complex and BioPerine), recovery-boosting beta-alanine, and electrolyte-rich organic freeze-dried coconut water. Oh, and did we already mention we love the inclusion of stevia? Memo to other post-workout manufacturers: try following suit. More consumers will love you for it. This supplement also has no proprietary blends, fillers, and dirty ingredients for good measure. Unfortunately, Too Fit Rally Natural Post-Workout is not a perfect product. The sodium content is somewhat high (11 percent of the daily value). Plus, we’re not too crazy about the protein (15 grams per serving) and leucine (one gram per serving) amounts. All in all, Too Fit Rally Natural Post-Workout covers all of the bases. It’s one of the few of its kind which does that. Awesome. There’s no question Too Fit Rally Natural Post-Workout can help you achieve all of these (and then some) with it’s complete formula. Many consumers swear by it. We do, too. Too Fit Rally Natural Post-Workout is intended for healthy and active individuals who are at least 18 years of age and want to build muscle, increase strength, improve hydration, boost recovery, and achieve their regular fitness goals. Too Fit Rally Natural Post-Workout has no glaring side effects. However, we encourage those who are monitoring their sodium intake to ask their doctor for advice as this product has a somewhat high sodium content. 2:1 carb-to-protein ratio. 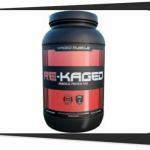 Helps replenish glycogen stores and build muscle. 30 grams of cyclic dextrin per serving. Boosts endurance with little to no side effects. Has all of the essential post-workout ingredients. Creapure, beta-alanine, BCAAs, glutamine, and coconut water. Antioxidants & Adaptogens Blend. Helps ward off inflammation and free radicals. Absorption Enhancers Blend. Bioflavonoid complex and BioPerine for better nutrient absorption. Good ingredient combination. Ingredients work synergistically to help you achieve your post-workout goals. Clean ingredients. No fillers, dirty ingredients, and proprietary blends. Good reputation. Product has gotten good reviews from customers. Somewhat high sodium content. Eleven percent of the daily value. Check with your doctor first. Low protein and leucine contents. Fifteen grams and one gram per serving, respectively. Somewhat expensive. $59.99 for a 20-serving, 2.9-lb. container. Now it can be told, folks: Too Fit Rally Natural Post-Workout is really “The Most Complete Recovery Fomula,” like the manufacturer claims. Aside from the staple ingredients (creatine, glutamine, BCAAs, beta-alanine, etc. ), where can you find a clean post-workout which has PeptoPro protein, coconut water, stevia, sumac bran, turmeric? We knew you’d be stumped. Like we said, it would have been better if the sodium content was lower and the protein and leucine contents were higher. All things considered, we still highly recommend Too Fit Rally Natural Post-Workout. Try it. You won’t be disappointed.